At the end of 2014, we released the largest update we’ve ever made to WP Courseware. After months of development and testing and with the guidance of one of the smartest people in the WordPress ecosystem, our friend Chris Lema, we were able to incorporate dozens of new features within our quiz module. I have to admit, it was a very challenging process at the time. I believe our project scope document which our development team worked through for the update was around 40 pages. Up to that point, these documents which we use to request and explain new functionality had reached maybe 10 pages. 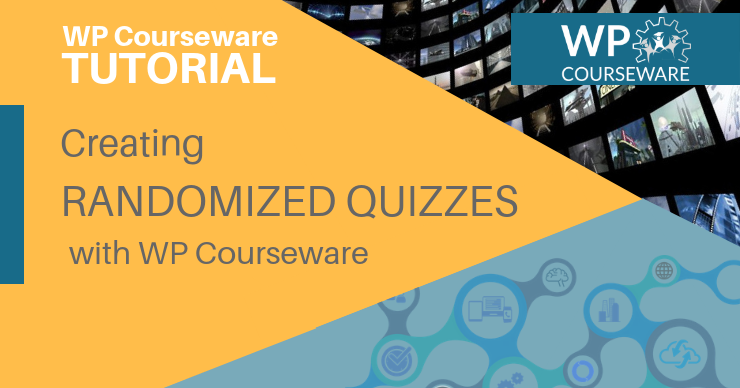 While WP Courseware’s quiz module has undergone many, many changes since the 3.0 version was released back in 2014, the release was the first which included the ability to create a question pool and randomly present a certain number of questions to a student on each quiz attempt. It also introduced the ability to randomly present different multiple choice quiz answer selections with added functionality to present more than one correct answer to a question. These options may sound simple, but they have a massive impact on learning retention rates for students who take online courses. As they say, practice makes perfect. And a study conducted at Rutgers University in 2013 found this to be true. Researchers found a 12% increase in learning retention after four to five months using a randomized quiz question strategy. In this post, we’re going to take a look at how you can create randomized quizzes for your students in WP Courseware. 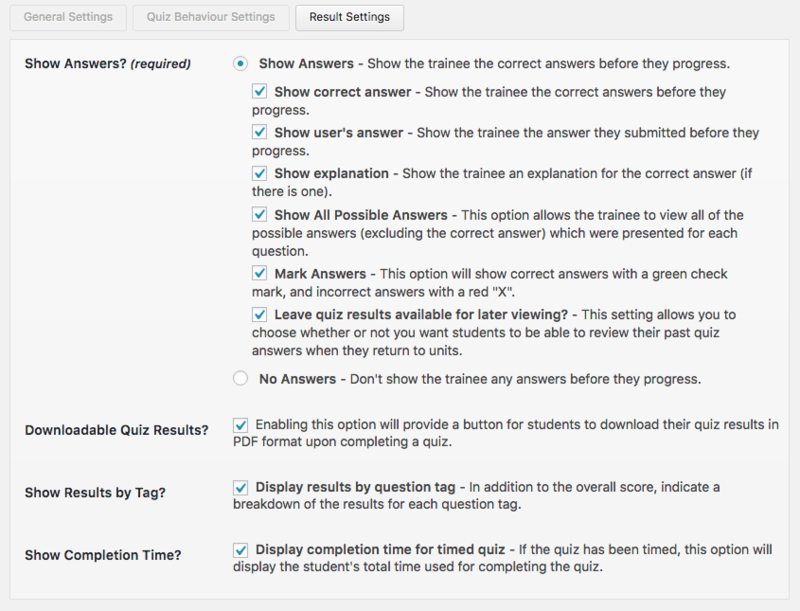 Each time a new quiz question is created in WP Courseware’s quiz module, it will be added to the question pool. 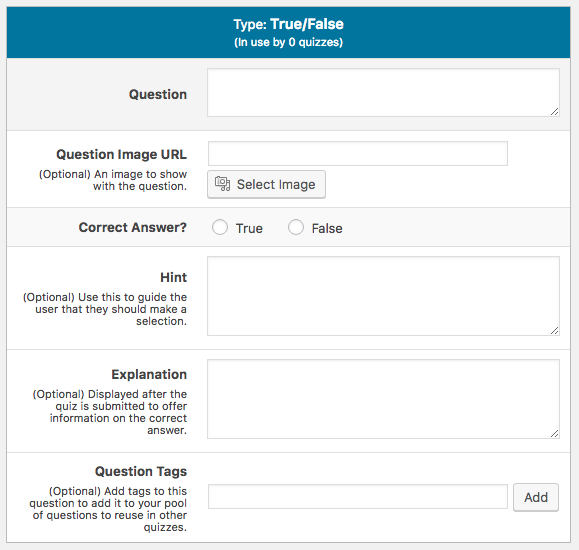 The current question types available include true/false, multiple choice, open-ended text entry, and assignment uploads. However, the most popular selections for randomized quizzes by far are true/false and multiple choice. Once WP Courseware is installed and activated and you've created a new course with at least one lesson, begin by navigating to the WP Courseware sidebar menu and select Questions. This brings us to the main Question Pool screen. 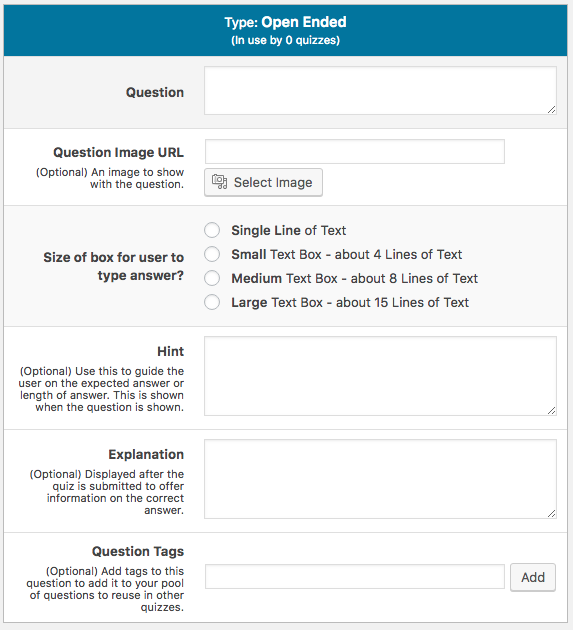 This screen will list all questions and also let us know the name of the question, the question type, which quiz a question is associated with, and any questions tags which may have been added to the question. We'll discuss question tags again shortly as they are a component of the randomization process. Once we're in the Question Pool, we'll select Add New to enter a new question. Once we choose Add New, we'll enter a new screen where we can select which question type we want to add. The first quiz question type is Multiple Choice. 1. First, we’ll enter our question text. 2. Next, we see a column with a series of check boxes next to each answer to indicate the correct answer for the question. It is possible to select multiple correct answers and even if you choose to randomize answers, the correct answer(s) will always be displayed when the question is displayed. 3. 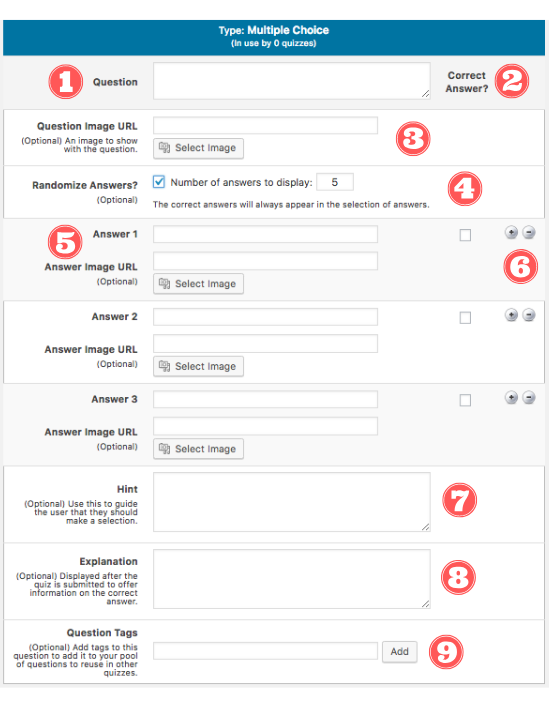 The Question Image URL field can be used to display an image within your quiz question. 4. Step 4 is where we can select whether or not we want to randomize our question answers. If we select this option, we can also choose a number of answer choices to display. For example, we may have 25 possible answers, but choose to display only five of those. Again, correct answers will, of course, always be displayed. 5. Each answer can include text, an image, or both text and image. 6. The “+” and “-“ buttons allow you to easily add or delete the number of possible answers. 7. The optional Hint field easily allows for providing guidance in how to answer a particular question. 8. The Explanation field displays after a student submits their quiz and provides for any type of guidance after a student has answered. 9. Finally, we have a question tag field. 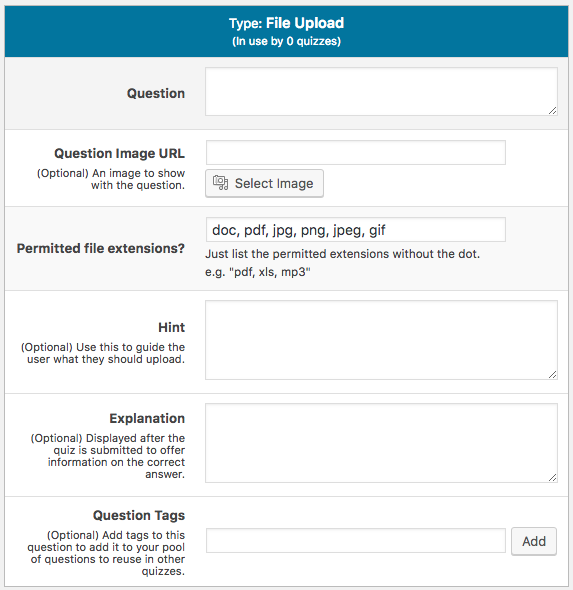 This works much like a WordPress post tag and allows you to categorize questions by topic. This will work in conjunction with question randomization which we'll cover shortly. The second quiz question type is True/False. This question type functions almost identically to the Multiple Choice question type, however, only allows for the option to choose between an answer of True or False with radio buttons. Next we have an option for Open-Ended questions. Open-Ended questions are similar to the first two question types in terms of configuration. However, these questions allow for free-form text entry, such as an essay, a one-word answer, or even possibly a solution to a mathematical problem. To enhance the flexibility of this question type, we've provided one more setting which allows you to configure the number of lines of text which the text-entry box displays by default. This helps to guide students in the length of response you expect. One caveat about this question type...responses to this type of question will need to be manually graded by an instructor. Finally, we have the File Upload question type. This question type allows students to submit a file to an instructor which can be reviewed on the admin side of the site and graded. This can be any type of file, but only file extensions listed in the Permitted file extensions? field can be submitted. Other file types will be rejected and the student will receive an error message stating the allowed file types. Next, we'll need to create a quiz for the questions we created. 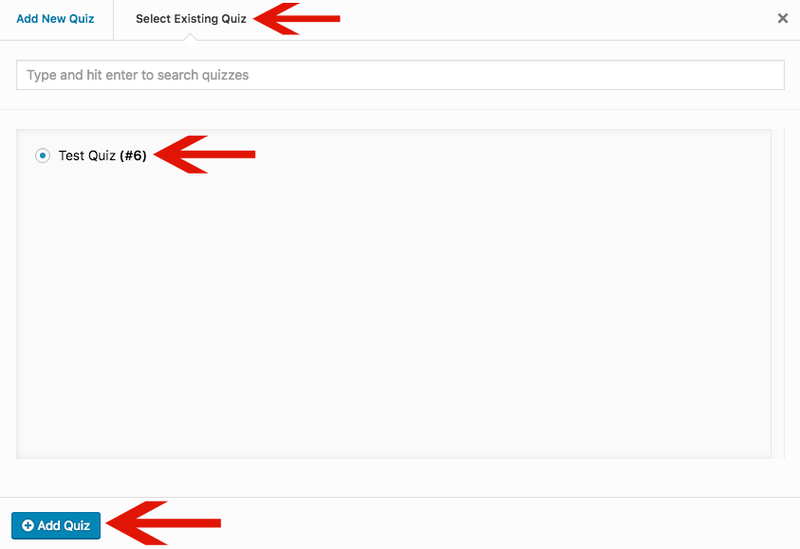 To do that, we'll navigate to the Quizzes tab in the main WP Courseware sidebar menu and then select Add New. Once we chosen to add a new quiz, we'll be presented with three tabs. The first of these tabs is the General Settings. Within the General Settings tab, we'll be able to create a Quiz Title, create an optional Quiz Description, and we'll set the Quiz Type. Next, we'll move to the Quiz Behavior Settings tab. Do we want to show a Recommended Score to our students to let them know how we might have expected them to perform on the quiz? Do we want to Paginate Questions? so students can view them one at a time? Do we want a Set Time Limit for Quiz and if so what is our Time Limit in minutes? We can set our required Pass Mark on a percentage scale. We can set a Number of Attempts Allowed if the student fails the quiz. This can be unlimited or any integer from 1 to 30. Do we want to Show Answers to the student? Show correct answer - Show the trainee the correct answers before they progress. Show user's answer - Show the trainee the answer they submitted before they progress. Show explanation - Show the trainee an explanation for the correct answer (if there is one). Show All Possible Answers - This option allows the trainee to view all of the possible answers (excluding the correct answer) which were presented for each question. Mark Answers - This option will show correct answers with a green check mark, and incorrect answers with a red "X". Leave quiz results available for later viewing? - This setting allows you to choose whether or not you want students to be able to review their past quiz answers when they return to units. 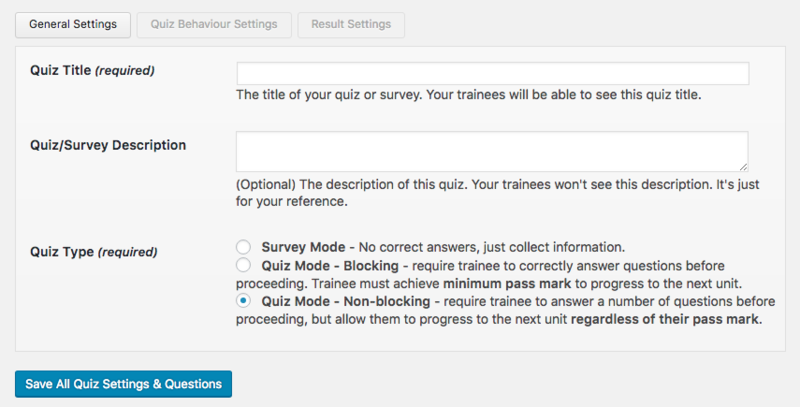 NOTE: Optionally, quizzes can be created through the new WP Courseware course builder interface. To do so, as displayed in the following screenshot you would simply enter the course editor, hover over any course units, and select + Add Quiz. If the quiz we're going to use was not created with the noted option above and added within the course builder, we'll need to manually add it to a particular course unit for it to display. A course unit doesn't need any content other than a quiz for that quiz to display, however, the quiz does need to display within a unit. This could be at the end of a lesson with content or simply even a single unit solely dedicated to the quiz. To do this, we'll go back to the course builder/editor for our course, find the unit we'd like to add the quiz to, and once again select Add Quiz as noted above. Once the modal opens, we'll choose Select Existing Quiz instead of Add New Quiz, locate our newly created quiz, select the radio button next to it, and then press Add Quiz. Now our quiz is placed within that unit. We have a course, we have a unit, we have a quiz, and we have a pool of questions. Now we're going to start slinging those questions around within our newly created quiz. As seen in the screenshot below, we'll now head back to the main WP Courseware sidebar menu, choose Quizzes, and then we're going to select Add Random Questions. First, we can choose to Randomly Select from Entire Quiz Pool. We can then set a number of quiz questions to be displayed. 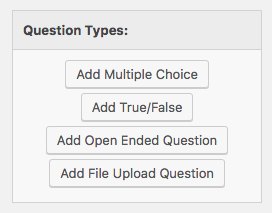 This option ignores question tags, so if you only have one or two courses which are closely related in terms of topic then you may just want to pull questions from all of the questions you've created. Second, if you have tagged your questions when you created them (such as by topic or course), you can choose to Randomly Select using Question Tags from any number of questions tags. For example, we have a number of users who teach professional development courses and they may need to present 10 questions on 10 different topics to meet regulatory requirements. Again, creating randomized quizzes is a great way to increase learning retention for your students. But it's also a great way to expand the depth of the topics they're learning about without overwhelming them during each quiz session. 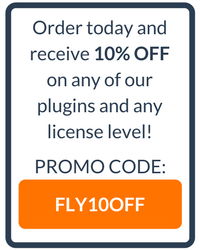 If you have any questions on how to utilize this powerful WP Courseware feature, please feel free to reach out to us!